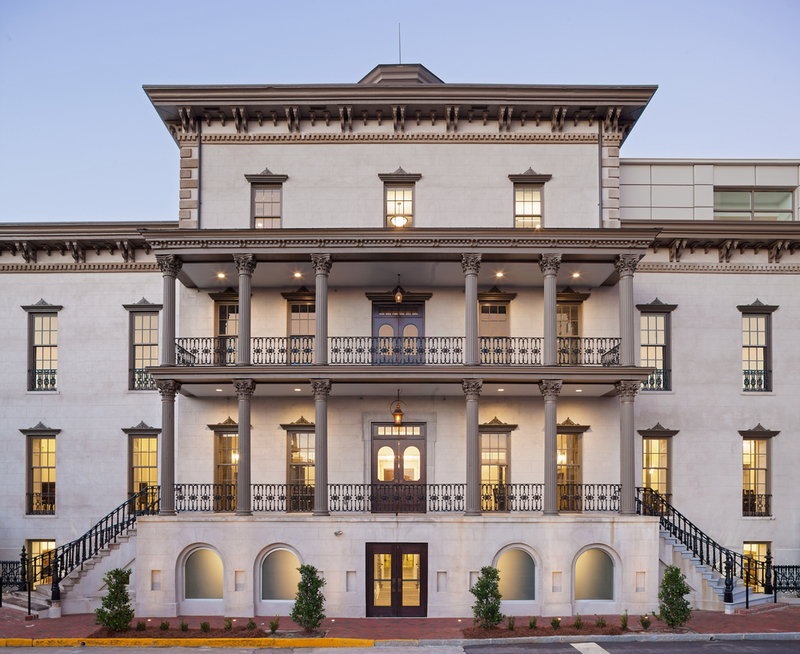 After years of vacancy and disrepair, the Old Candler Hospital Complex has a new identity as the Savannah Law School, a branch of Atlanta’s John Marshall Law School. The renovations of the facility occurred in a multiple phases over a three year period. The second phase of the project, the Law School Library, focused on a full interior and exterior restoration/rehabilitation of the 1819 original hospital building including demolition of the 1968 wing on Abercorn and Huntingdon Streets which allowed the original façade to be revealed and the street to be restored to the urban grid. Renovations to this 1819 building included in-kind replacement of the east side of the entry porch; in-kind replacement of all exterior windows, lintels, and sills; and in-kind replacement of the east wing cornice. Other improvements to the building included replacement of the 5th floor cupola and the windows at the ground level. The original openings at the ground floor arcade under the front porch were reestablished and recessed storefront windows with frosted glass were installed. Although the CMU penthouse on the east wing remained, windows were added and the walls re-clad with decorative metal panels. All repair and replacement of historic features were done in compliance with NPS Secretary of the Interiors Standards. 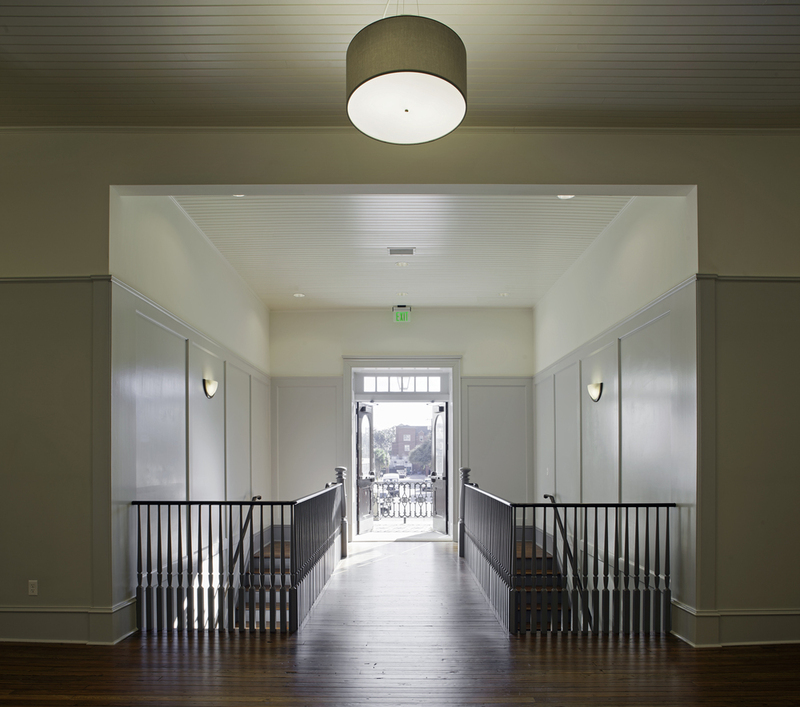 After years of vacancy and disrepair, the Old Candler Hospital Complex has a new identity as the Savannah Law School, a branch of Atlanta’s John Marshall Law School. The renovations of the facility occurred in a multiple phases over a three year period. 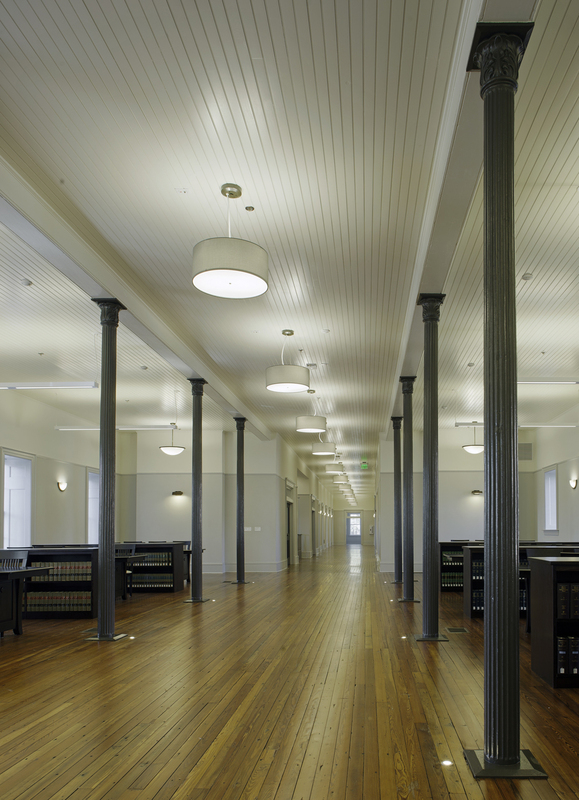 The second phase of the project, the Law School Library, focused on a full interior and exterior restoration/rehabilitation of the 1819 original hospital building including demolition of the 1968 wing on Abercorn and Huntingdon Streets which allowed the original façade to be revealed and the street to be restored to the urban grid. Renovations to this 1819 building included in-kind replacement of the east side of the entry porch; in-kind replacement of all exterior windows, lintels, and sills; and in-kind replacement of the east wing cornice. Other improvements to the building included replacement of the 5th floor cupola and the windows at the ground level. 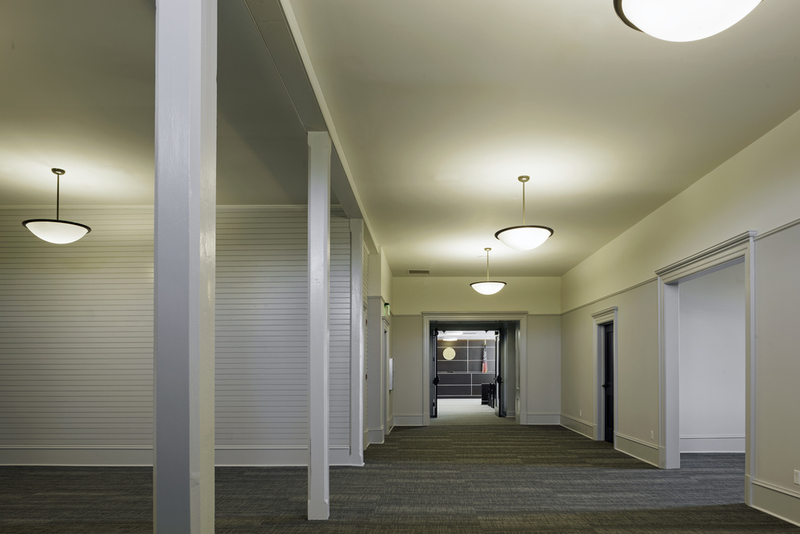 The original openings at the ground floor arcade under the front porch were reestablished and recessed storefront windows with frosted glass were installed. Although the CMU penthouse on the east wing remained, windows were added and the walls re-clad with decorative metal panels. All repair and replacement of historic features were done in compliance with NPS Secretary of the Interiors Standards.